Client Catches – Wet and wild bassing! “Can you really catch bass in these conditions” and “Is it going to be too rough”? The first two question my clients asked upon arriving high up on the cliff-tops – above a stunning array of coves, rocks and gullies… “Most definitely” and “not at all” were my answers. Weather wise, it was pretty miserable! Misty, with a swirling rather than an ‘in your face’ wind, all interspersed with periods of heavy drizzle – quintessential daylight bass fishing conditions you might say! In regards to the actual sea conditions – 18″ of clarity, a flooding spring tide (with the swell due to increase during the day) in addition to hardly any floating weed to speak of, spelt one thing to me – bass! I could sense the competitive streak in both ‘Grim’ (as he liked to be called) and Johnny before the first cast was made! Out on the first mark, I positioned them 20m apart along a large promontory of rock – common to the area we were fishing. The water here is around 5 – 7ft deep and the seabed is a mixture of sand and car size rocks where some of the rocks protrude above the surface an hour either side of low water. The beauty of having two clients to guide in the same session is that I can utilise different lure types and patterns, effectively searching out the water column or possibly assisting to determine what the bass are feeding on. As both clients had very impressive lure collections I was spoilt for choice, but I eventually settled on a 120mm, 12g jighead Fiiish Black Minnow paddletail for Grim and a Bear king Slim Skimmer surface lure for Johnny. My thought process (there’s always a method to my madness!) was based on many experiences of this mark, in very similar conditions. As the tide begins to flood and the swell/wave height increases, the bass tend to move through the area very quickly therefore, you need to catch their attention and intercept them. I instructed Grim to mix up his retrieve styles between bouncing a paddletail around on the sand, fishing it ‘sink and draw’ and then straight retrieving it. Johnny on the other hand, was asked to cast and ‘work’ the surface lure in and around the protruding rocks (and associated white water). This way, we would be covering a large area and the entire water column. Due to the amount of cover and potential ambush points on this mark, if the bass are present they will smash a lure almost instantly. And it was within the first 5 minutes that Grim had the first ‘hit’ subsequently landing this plump little bass below. He was happy I promise! This small bass showed itself at the start if the flood, and hit a Fiiish Black Minnow that was being bounced on a patch of sand (approx 4m x 5m) between the car size rocks. Within minutes of replacing the Fiiish Minnow with another new one (it had been mangled by the bass, and is a common criticism of these proven fish catchers), I heard Grim’s shout above the sound of the crashing waves – it was another slightly smaller bass this time, that had hit the lure in mid-water. I now remained with Johnny, ensuring he was mixing up the direction and area he was casting into. I had just turned my back in preparation to changing his lure over to a paddletail when a I heard him shout “Got one”! It was certainly no match for his well-balanced lure set up and he very quickly managed to swing it onto the rocks. But it was his sheer enthusiasm and total respect for the small bass that struck me. “Just look at them, they are just perfect in every way aren’t they” he said (I couldn’t agree more) as he gently returned the fish via an area sheltered from what was becoming quite a rough sea. It was at this point, thinking that the bass were now swimming slightly higher in the water that I changed Grim’s lure over to a natural sandeel coloured 12.5cm/16g jighead Savage Gear Sandeel to work in a straight or linear retrieve style. Just as it was time for us to retreat from the quickening tide, Johnny caught his second on a shallow diving minnow and Grim added a third on the Savage Gear Sandeel – both were small. Pleasantly surprised at catching five bass on lures from the first spot, they couldn’t contain their disbelief at just how shallow (but still relatively clear) the water was on the second mark. Here, a group of rocks enables two anglers to cast and retrieve a lure into two separate inlets, working the lure over flat platforms of rock, with narrow interlinking gullies also present – really lovely bass ground. “No way” they both said – “Can bass really swim and hunt in such shallow water in these turbulent sea conditions”? And to be fair, it probably did look severe to what they were used to – which was primarily LRF (Light Rock Fishing) in harbours and calm backwaters. Indeed, they had booked me because they wanted to learn how to catch bass, on lures, from the open coast – well they were definitely experiencing that today! A Savage Gear Manic Prey 95. Great action, great casting capabilities and at a great price + they catch bass! Buy some before they become extinct! The mark yielded a bass apiece – Johnny’s on the small Bear King surface lure and Grim’s took a Savage Gear Manic Prey 95 which was cast continually into a very specific area, in only 2ft of water until predictably, the bass appeared. Again, both were only small fish (1lb or so) but it confirmed bass were hunting well and truly in the melee as the tide flooded into large pools and gullies. At 5 bass to Johnny’s 3, following a short walk along the south-west coastal path we clambered down the slipper path to an inlet that is remarkably similar to the previous spot. As I’ve written in previous posts, bass will very often move into such inlets (a gully if you like that leads to a dead-end under the cliffs) as the tide floods, and especially one hour either side of the high tide period. The tide and waves were really pumping in by the time they made their first casts and it was Johnny who was nailed by a spikey sliver of pure natural predator in the form of this bass below. This little fella was really not happy at being held up for the camera! The bass above engulfed an IMA Hound Glide 125F (below) in the Cotton Candy colour, very close to the rocks in only 18″ of water. 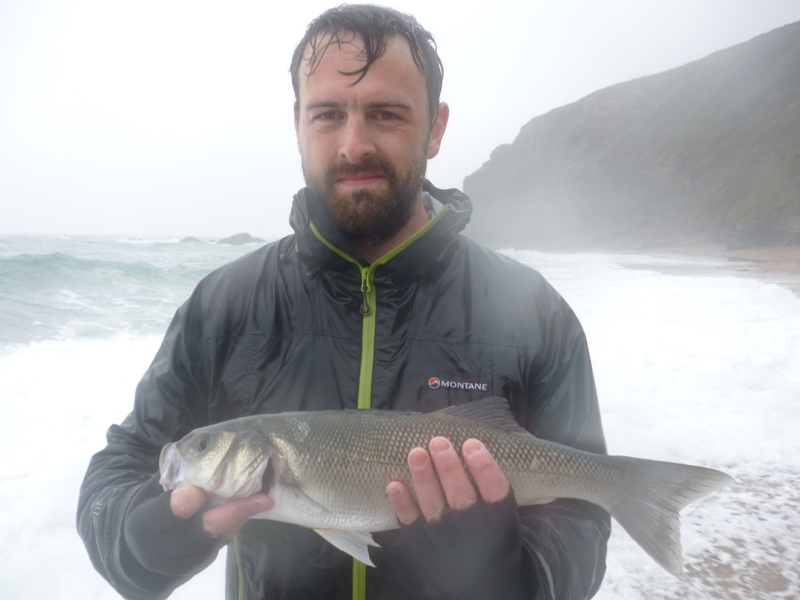 Clearly, the overcast, dull weather conditions and flooding tide in conjunction with the clear, but relatively lively sea, had served to really bring the bass on the feed following a period of settled weather. The IMA Hound Glide 125F. Arguably one of the best lures out there for casting into head winds (it has been cast up to 78m in tests) and the ease at which it can be ‘worked’ in rough seas. It is very stable in the water and ‘swims’ at between 2 – 3ft. It was getting a little ‘hairy’ in this inlet as the tide and wave height increased therefore, we embarked on a short walk to a nearby steeply shelving shingle beach/cove. “Now this is a step too far surely”! Grim and Johnny were lets just say ‘unconvinced’ that they would encounter bass from a beach. Perfect conditions for casting a lure from a beach. Keep the lure ‘swimming’ in line with the angle of the waves (don’t work the lure across them) to minimise weed collecting on the line. Moreover, fishing with the rod tip up and then lowering it in the final moments of the retrieve will greatly assist in keeping the lure wriggling away in the undertow… Go get em! I absolutely love catching bass on lures from a beach in stormy weather. They really whack a lure in the surf as I imagine they only have a split second to decide whether to eat it! Bass instinctively ‘know’ how to battle it out in rougher seas, and will use the undertow to their advantage – with the bigger ones generally powering parallel to you. However, there is a bit of an art to maximising the opportunity to lure fish in such conditions. Minnow type lures that can really ‘get out there’ and then ‘dig’ into the swell are definitely the way ahead. Lures such as the IMA Hound Glide 125F mentioned above, the Megabass Zonk Gataride 120 and Daiwa Shoreline Shiner Z120F or 130F/ are great at this. In order to fish them correctly, keep the rod tip ‘up’ at 45 degrees until the lure is closer in (this limits the amount of weed potentially collecting on the line). Retrieve steadily so that you can feel the vibration of the lure through the line and rod tip. 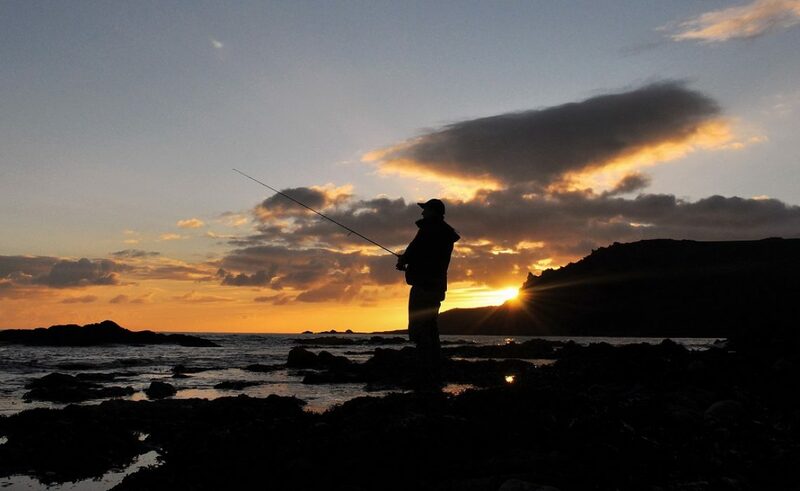 Try to almost ‘hold’ the lure (stop retrieving it) in any backwash and also remember to speed up the retrieve when the lure is within the final two metres from the water’s edge. It is within these two periods (and quite often as a wave turns onto the beach) that a high percentage of bass will nail the lure – very exciting indeed! With Johnny fishing with one of my IMA Hound Glides, I picked a brown coloured Megabass Zonk Gataride out of Grim’s lure box – “My Girlfriend bought me that one” he joked, “It would be great to catch something on it to prove to her it works”! Smiling, I attached it to his lure clip and watched him crunch his way down the shingle bank towards the white foaming water that was being pushed up the beach. The surroundings were truly magical. The cliffs were high above and behind us, the wind was blowing hard in our faces and the roar of the waves was almost deafening – a fantastic setting in which to catch a bass. With both clients launching the perfect tools for the job out onto shingle covered by between 3 – 8ft of water (depending on the size of the waves moving in) I was confident we’d see another bass in the final hour of the session. WHACK! Grim’s lure rod thumped down hard and stayed down as battle commenced. I don’t really think he could quite believe he was connected to a fish until the best bass of the day appeared on the crest of a large wave about two metres out. This is when Grim had to be very careful, as a lot of bass are lost when the power of the backwash (and the pressure this places on the hook hold) often results in a lost fish – and lots of swearing… But he timed it brilliantly, utilising a large wave to effectively ‘dump’ the bass on the beach, whereby I grabbed the line and gently pulled it to safety before the next wave could potentially rob him of his glory. You can see the delight on his face! Grim was overjoyed at catching this lovely bass in such exhilarating conditions. The pair of them were completely invigorated and with anticipation levels set at maximum, it was Johnny who connected with what was undoubtedly a bigger bass than the ones he’d already landed. He couldn’t have done any more, remaining in contact without excerting to much pressure, but the bass somehow managed to throw the hooks – a real shame. Johnny smiling at Grim – both of them remarked that standing in the surf, casting lures from the beach alongside the anticipation of getting hit be a bass was the highlight of what had been a very successful day. They both latched into and lost bass respectively before, soaked to the skin from the rain rather than the waves, we called it a day. It had been a red letter day – although the bass were all on the small side (certainly compared to the many 4lb+ bass clients my clients have landed this season) to catch ten in a session was fantastic. Just got back from an amazing 8 hour session. Shattered, soaking wet and couldn’t be happier. Marc’s knowledge of the marks, techniques, watercraft and lure selection is second to none. I caught bass in places I wouldn’t have even considered fishing before this trip, landing a bass off the beach in heavy surf was the absolute highlight. I’m now going to revisit some marks I’ve overlooked in the past, definitely an eye opening experience and a real confidence booster. Couldn’t recommend it more. When you consider the multitude of locations, conditions and methods in which bass can be targeted they really are an extraordinary species. Through experience, catches and indeed blanks, you gradually begin to understand their habits – all of which creates an instinct towards where they will most likely be encountered. Next Client Catches – Patterns in habits and behaviour are key!